Russian President Vladimir Putin has long expressed his disdain for NATO, but if the nationalist fervor taking over much of Europe and America continues, he won’t have to do too much dismantle the alliance. To the contrary—all he has to do is sit back and watch nativism and racism convince Europeans and Americans that refugees, not him, are the real threat. And, if necessary, use cyberattacks to fan the flames. Over the past four years, more than 1 million Syrian refugees have applied for asylum, with Germany taking in a bulk of them. And over the past four years, refugees have been blamed for much of Europe’s aggressive austerity measures that nationalistic politicians have used to argue that leadership they seek to replace is prioritizing outsiders over citizens. The rhetoric has had great success. In 2015, nationalist parties in Denmark, France, Hungary, Australia gained significant numbers of seats in national elections; many of them ran on platforms vowing to restrict immigration and denounce NATO. For example, the leader of Austria’s far-right Freedom Party Heinz-Christian Strache blames NATO for the refugee crisis. Marine Le Pen, head of France’s far-right National Front and leading presidential contender, vows to take France out of NATO. Each has benefitted in some way from Putin. Le Pen, who speaks warmly of Putin, has had her political career financed by Russian banks; Strache’s party signed a cooperation pact with Putin’s United Russia party. What is particularly dangerous about this rise of nationalism that is increasingly anti-NATO is that it gives Putin further incentive to encroach on former USSR states. Poland, for example, remembers Russian tanks on their soil. So do the Czechs and the Hungarians. 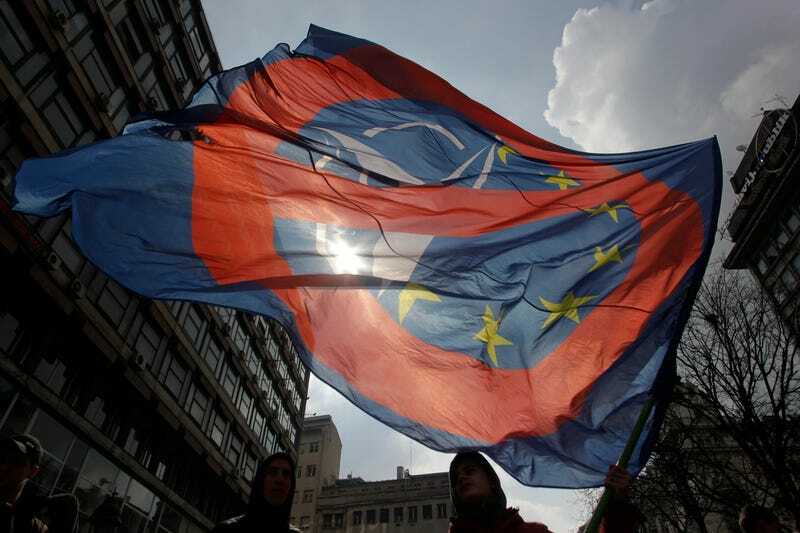 It is one of the reasons why most eastern European nations continue to affirm their support of NATO, even as right wing parties in western Europe continue to look at the alliance with suspicion, perhaps, because their nations are not on the front lines of a potential Russian conflict. One of the reasons right-wing populism is gaining momentum is the belief that refugees are taking resources and jobs away from native-born citizens. In Germany, Chancellor Angela Merkel has been the most vocal leader in challenging the continent to welcome as many refugees as possible. Consequently, her efforts have hurt her politically, as right wing parties have gained ground in local and national elections over the past few years. The reason, as Ian Bremmer wrote in Time, is due to Merkel’s ‘open-door’ policy on Syrian refugees. Anti-immigrant and anti-NATO sentiment is not exclusive to Europe, of course. President Donald Trump’s racist, nativist rhetoric is so powerful that his supporters tend show more support over building a wall on the U.S.-Mexican border than rebuking Putin over hacking the U.S. election. “Together, Russia and the Assad regime are deliberately weaponising migration in an attempt to overwhelm European structures and break European resolve,” Gen Breedlove told the Senate Armed Services Committee. “These indiscriminate weapons used by both Bashar al-Assad, and the non-precision use of weapons by the Russian forces, I can’t find any other reason for them other than to cause refugees to be on the move and make them someone else’s problem,” he said. As wild as Breedlove’s remarks sound, they are completely legitimate. Putin is using hybrid warfare in Ukraine to destabilize that country. He claims there are no Russian combat troops there, but admits to supporting rebels that are waging war against Kyiv. The war has left nearly 10,000 people dead and halted any hopes Ukraine had of joining the European Union and, subsequently, NATO—which, before the 2014, were bodies the nation had a legitimate shot of joining. That said, why wouldn’t Putin exacerbate the Syrian crisis by creating more chaos in Syria to force its population to turn on itself and against NATO? Even if you do not want to add any validity to Breedlove’s statement, it is hard to argue that Putin isn’t benefiting from the nationalist fever that is causing many in Europe to see immigrants as more of a threat than Putin. Nationalist leaders have found success utilizing the populist zeal that stresses isolation over integration that many of them find as hallmarks of Putin’s strength. Part of that isolation includes identifying threats among communities that do not pose any proven national security risk. The thinking is that they—Muslims, Africans, anyone who is non-white, basically—is viewed as a pull on society and must go. One European leader who has fought against this tide of racism has been German Chancellor Angela Merkel, who has drawn the ire of the country’s far right—and, allegedly, Putin. Merkel, who is running for reelection, may have been a target of a Russian cyberattack, according to Germany’s top intelligence officer. The most devastating exercise of that belief was carried out by Trump this weekend with his executive order that bans citizens from seven Muslim nations from entering the United States. None of the countries on the ban list have as a suspect who is known to have committed fatal terror attacks against the United States in more than two decades, as Slate points out. And, worse of all, his supporters do not seem to care that his order amounts to nothing more than xenophobia. And why should they? As I wrote in a recent piece, Trump supporters do not have time to worry about Putin because their racism has tricked them into believing that refugees are a greater threat than the man who carried out a cyberattack against America. Like America, Europe is constantly the target of extremism from groups like ISIS, but the greatest threat of all may very well be peoples’ own prejudices and hatred for the other. As history tells us, hate can single-handedly destabilize vibrant nations. Slobodan Molosevic did it to Serbia. Hitler did it to Germany and Mussolini did it to Italy. Former President Barack Obama reminded Americans and Europeans of this recent history in Greece during a leg of his last trip to Europe in November. “I do believe, separate and apart from any particular election or movement, that we are going to have to guard against a rise in a crude sort of nationalism, or ethnic identity, or tribalism that is built around an ‘us’ and a ‘them,’” Obama said in Greece, the first stop of what he called his final foreign trip as president. Europe and America are at a unique crossroads, whereupon anti-immigrant sentiment is dangerously inching towards violence. And, in light of increases of racist attacks against immigrants in Europe and America, people really have to ask themselves who the real enemy is. So far, many are picking immigrants fleeing wars rather than the Kremlin. If Le Pen wins the French presidency this year and other nationalist leaders in other countries follow suit, Europe will be full of Eurosceptic heads of state that will not have time to be looking at Russia as a threat. And if that happens, Putin will have defeated NATO without firing a single shot. Hate will have delivered the alliance’s death blow. Could One Retired General Really Save Donald Trump&apos;s Pentagon?